Republicans fear a failure to overhaul strict Texas voter ID rules could torpedo the state's position in litigation over whether lawmakers discriminated against minority voters. Editor's note: This story was updated May 21 to add that the bill was put on the House calendar Sunday. With bill-killing deadlines looming, some Texas Republicans are trying to unstick legislation that would overhaul the state’s voter identification rules, saying failure to do so would torpedo the state's position in a high-profile court battle over whether lawmakers disenfranchised minority voters. Inaction, they fear, would dramatically boost the odds Texas would return to the list of governments required to seek federal approval before changing their election laws. Last year, the U.S. 5th Circuit Court of Appeals ruled Texas lawmakers discriminated against minority voters by enacting one of the nation’s strictest voter identification laws in 2011. And in April, U.S. District Judge Nelva Gonzales Ramos upped the ante: She ruled the state discriminated on purpose. That raised the possibility that she might invoke a section of the Voting Rights Act and put Texas under federal election oversight. Responding to those rulings, Texas Attorney General Ken Paxton and other Republicans have pointed to Sen. Joan Huffman’s Senate Bill 5, which in some ways softens current ID rules, in order to call scrutiny of the 2011 law moot and counter arguments that Texas can’t be trusted to protect minorities’ voting rights. “SB 5 contains the changes needed to comply with the Fifth Circuit’s ruling while ensuring the integrity of the voting process,” Paxton said Friday in a statement to The Texas Tribune. Lt. Gov. Dan Patrick called SB 5 “a must-pass bill" in news conference this week. Gov. Greg Abbott's office declined to comment. The legislative clock is ticking while Paxton’s lawyers are preparing to return to Ramos’ Corpus Christi courtroom. If they show up to a June 7 status conference without voter ID reform, some Republicans fear Ramos will immediately order federal oversight. 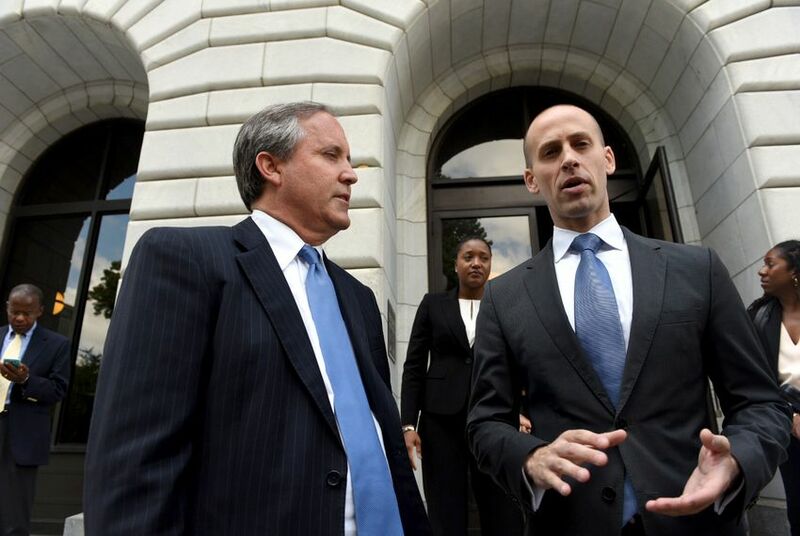 Chip Roy, the former first assistant attorney general in Paxton’s office, called such an outcome a “high likelihood." For decades under the Voting Rights Act, Texas — with its lengthy history of discriminating against minority voters — needed federal permission to change its election laws, a safeguard for minority voting rights called preclearance. A 2013 Supreme Court ruling — Shelby v. Holder — wiped clean the list, freeing Texas and other jurisdictions to change election and voting laws without permission. But the ruling left open the possibility that new findings of purposeful discrimination could catapult governments back under preclearance, with oversight from the Department of Justice or a special judicial panel in Washington, D.C. The voter ID decision is one of three federal rulings this spring that could return Texas to preclearance, and some experts call it the most likely avenue. Paxton said he was “highly confident” the House would pass SB 5. Amid the chaotic wheeling and dealing of the session's final days, however, some Republicans are sweating as they try to free the languishing legislation. “Given the importance of [the June 7] hearing, it is a real head scratcher why this bill has not been set on the House Major State Calendar for debate,” Sen. Paul Bettencourt, R-Houston, said in an email. “I can only imagine what the consequences might be if they do not." A spokesman for Straus, R-San Antonio, declined to comment on Saturday. Huffman’s bill would add options for Texas voters who say they cannot “reasonably” obtain one of seven forms of ID currently required at the polls. But it would also create harsh criminal penalties for those who falsely claim they need to choose from the expanded list of options. Minority rights advocates have called the expanded list of options an improvement over the 2011 law, but they have pushed for ID options beyond those included in Huffman’s bill and raised concerns over the strict penalties for false claims. Perales said she believes the plaintiffs could convince judges that Texas should return to preclearance even if SB 5 passes. And if it doesn’t? “I expect it would affect Texas’ strategy,” she said. The 2011 Texas Legislature discriminated against minority voters, according to federal judges, by requiring forms of acceptable ID those voters were less likely to own: a state driver's license or ID card, a concealed handgun license, a U.S. passport, a military ID card, a U.S citizenship certificate or an election identification certificate. Ramos temporarily softened the rules for the 2016 elections, and Huffman’s legislation somewhat follows its lead. The bill would allow people without photo IDs to vote if they presented alternate forms of ID and signed affidavits swearing a “reasonable impediment” kept them from obtaining such identification. Those folks could vote under the proposal by presenting documents such as utility bills, bank statements or paychecks. And election officers could not question the “reasonableness” of voters' excuses for not having photo IDs. “My intent with the bill is to take the road map that the Fifth Circuit gave us,” Huffman said when the bill cleared the Senate in March. Under SB 5, however, anyone found to have lied about not possessing photo ID — by falsely signing the “reasonable impediment” form — could be charged with a third-degree felony. Such crimes carry penalties of two to 10 years in prison. That’s partly why Democrats oppose the bill. Democrats argue SB 5 falls short of representing a Republican change of heart on voting rights.